Plastic casters can damage your expensive floor, leaving hard-to-remove traces and even more serious damage. Don't continue to use the chair mat anymore. The chair mat will limit your chair and only move within a small range, and do you think the chair mat really protects your floor? In fact, the chair mat will also cause damage to the floor, produce some scratches, and sometimes move with the chair. With our office casters, there are no problems with tiles or solid wood floors, no scratches, no There is a need for chair mat that are difficult to clean to protect the floor. Enjoy the smooth sliding of the chair on the floor. I think you must be tired of the noise caused by plastic casters. The sound of hard plastic casters is quite loud, Sounds painful. So we chose to use the new and unique polyurethane wheels. The rubber wheel can smoothly and quietly roll on any surface, wherever you want to go. .
A long service life, the thick design and high quality steel materials give our office chair casters an amazing service life. They can hold up to 650 lbs as a set of 5 to make users safer. 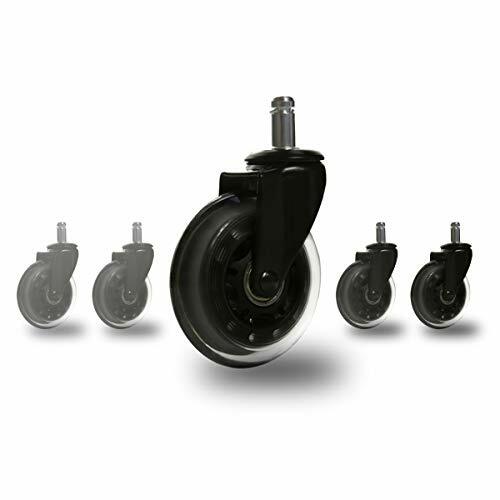 Our office chair casters are available in standard sizes for most standard office chairs. It can be disassembled without complicated tool operation, install simply, and it can be directly inserted into the position of the replaced caster. Free your office chair, you can't be dragged by heavy office chairs during busy work, so we took a solution like roller skates to make your chair as smooth as roller skates. Casters that are strong, safe and reliable. GET OFFICE WHEELS WITH STYLE:Our office chair wheels are available in standard sizes and are suitable for most furniture.Unique and fashion, whether it is a game chair or an ordinary chair, there is no need to worry about the fit. SIMPLE REPLACEMENT:Can be replaced without tools,pull out the old chair casters directly, then insert the new one into the original position until it is secure and fixed. SAFE FOR ALL FLOORS:Our office chair casters are made of polyurethane and are softer than traditional casters. They will protect your floor and apply to all kinds of hard floors without any scratches or marks. KEEP QUIET:Under the action of internal bearings, our office chair casters can move smoothly without noise, ensuring a quiet working environment. LONG LIFE OF CASTERS:Our office chair casters are made of high quality steel for greater stability and durability.No need to change your office chair casters frequently,these efficient caster wheels promise to last a lifetime. If you have any questions about this product by Toplimit, contact us by completing and submitting the form below. If you are looking for a specif part number, please include it with your message.